On Saturday, August 9, 2014 at the 111h annual Rainier Beach Back2School Bash, hundreds of residents, most of whom were youth and children, gathered at The Plaza at Rainier and Henderson to get inspired about their education, and to learn about the resources in their neighborhood. The Rainier Beach Community Empowerment Coalition an alliance of residents, organizations, institutions and businesses sponsored this event along with eight other organizations for the 11th year in a row. According to Wanda Saunders an event volunteer and resident “the Back2School Bash is very important, it’s a staple in our neighborhood. 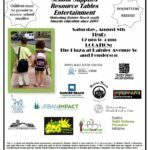 It should be bigger so that more families can benefit….that’s what we are going to work on that in 2014.” In addition to distributing over 400 back packs, 25 organizations hosted resource tables. The event was enhanced by the presence of local artists Vovinam who opened the event with the traditional Vietnamese Lion Dance, Mike Day a local hip hop artist, Congressman Adam Smith, and Seattle University’s men and women’s basketball teams. The traditional presence of the Rainier Beach Urban Farm and Wetlands was joined by newcomer Artwalk Rainier Beach (scheduled for September 6). Emerald City Bible Fellowship and R and R Outreach provided the food and Carrie House Church gave away over 800 books. 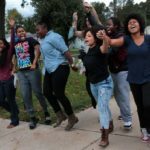 Many felt the fact that the event was in the Plaza (at Rainier and Henderson) was a plus, a plan is underway to program the space for the benefit of the neighborhood. One of the event organizers, Danielle Jackson, said “This event is a demonstration of how wonderful the Rainier Beach neighborhood is. Many people pitched in to make this event possible. People really do care about this neighborhood. We pulled together and saw to it that our families and their children have the resources and information necessary to be ready for school year”. Thanks to this year’s event sponsors (Emerald City Bible Fellowship, Rainier Beach Moving Forward, Rainier Beach Community Center and Pool, Atlantic Street Center, Carrie House Church, Urban Impact, Puget Sound Sage, Sound Transit) and the over 50 volunteers who made the event a success. 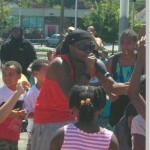 Interested in helping plan the 2015 Back2School Bash email rainierbeachneighborhood@hotmail.com or call 206.914.1762. 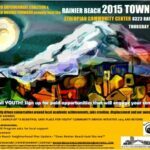 Next2014 Artwalk Rainier Beach a community building affair..right? Can you call me asap possible, I was planning with some of the partnering ministries, to pass out schools supplies and give away free food as well as Catholic Community Serivces was bringing there program that has resources for African America Community.